The Judge of the Michael Farmer trial wrote a book about his experience and it is an excellent and fascinating glimpse into the trial from the point of view of the Judge. In his book he says that it was the most expense trial (at the time) New York ever had with a couple dozen lawyers involved for the defendants and that there were 1,600,000 words in the case file. 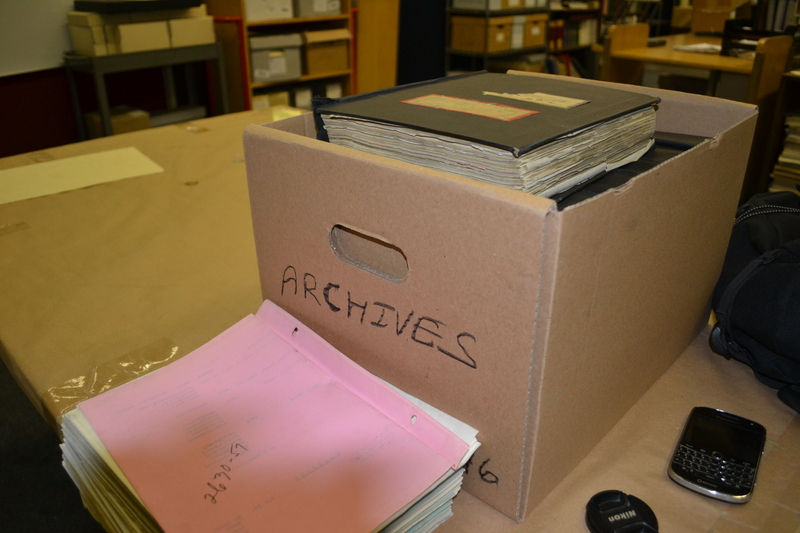 The boxes in the box are the trial minutes for the Michael Farmer trial and at the time the picture was taken the pages sitting next to the box were the ones I was working with. Just for interest’s sake I did a rough calculation to see how many words were in the trial minutes themselves. A word is five characters, so I counted a couple of lines of the trial minutes and they were about 40 characters per line, with about 24 lines per page with a total of 960 characters per page or 192 words a page. With 5,412 total pages the trial minutes themselves are just over a million words. That doesn’t include all the other pages of the case file, so it could very well be 1,600,000 total words. Either way, it was a huge case; probably the biggest case of the 1950s involving a gang killing.